I’ve had an infection or ‘red-eye’ and haven’t been able to use the gym or bathhouse so instead I’ve been walking up Warayong Mountain (Wikipedia location) in Song-So. 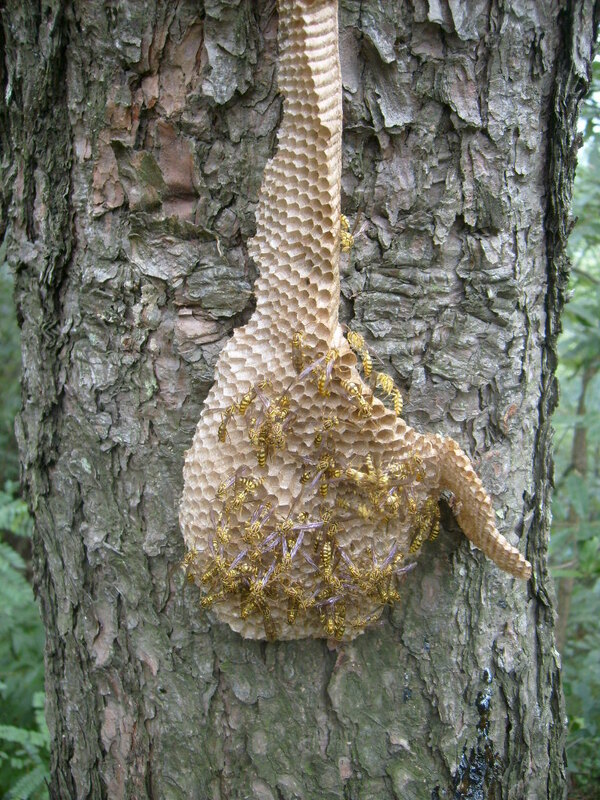 I noticed a wasp nest on a tree and watched it over several mornings. These wasps are much smaller than European ones. This is the shaman spider (무당 거미), which is often translated as ‘sorcerer.’ In English it is known as the golden banana spider or joro spider (nephila clavata). ‘ It probably measured about three inches long and can inflict a mildly painful but non-deadly bite. Autumn signals the mating season for spiders and these beautiful, if not scary looking specimens are also cannibalistic. The female is larger than the male and has red markings towards the back, underside of her abdomen. female shaman spider with distinctive red markings on the underside of abdomen. the nephila family spin one of the largest size webs – often in excess of 2 meters. The web was about 4 feet across and slightly yellow in colour and at one point I walked into a supporting strand. It did not break and I noted at the time how resilient it was. Apparently, genes from this spider have been injected into silk worm cocoons and as a result they subsequently produce a much stronger silk. This product is being launched on the market, in the form of extra durable socks, in 2010. Dude I just about soiled myself looking at those spiders! I hate those things and they are everywhere out here.